New Delhi, March 24, 2014: Growing population and urbanization, combined with fast increasing developmental needs, have put a tremendous pressure, on our water availability, especially for crop production. With a population of over 1.21 billion people, which is about 18% of the world's population, with 4% of the total usable water and 2.3% of the arable land available in the world, we face multi-dimensional challenges which are going to be further compounded, due to the impending climate change. 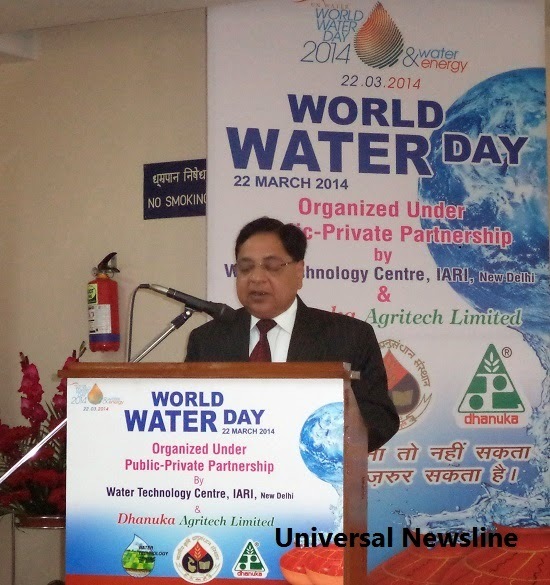 The agricultural sector is the biggest user of water, followed by the domestic sector and the industrial sector. Groundwater contributes to around 65% of the country’s total water demand, and plays an important role in shaping the nation’s economic and social development. Food, water and energy are important inputs and are more or less inseparable, as can be seen from recent events like droughts, oil-spills and increasing food prices. Delivering the Presidential Address, Dr R.B. Singh, Chancellor of Central Agricultural University said that agriculture technology is the driving force for achieving the much needed food and nutritional security for the burgeoning population. The National Water Policy enunciated increasing water- use efficiency at least by 20% from the present around 35%. This calls for several major policy decisions including rational water pricing, reducing water footprints, overarching national legal framework for water governance. Water and energy being scarce resources, more focused efforts are needed so that the available technological interventions with the research institutions like Water Technology Centre of IARI, in these interrelated important sectors are brought to the knowledge of the farmers. He called for creating model sites demonstrating optimization of water and energy at the farm level. Definitely Public-Private partnership between WTC and Dhanuka Agritech Limited – the two leaders in their own areas of activity can play a synergistic role for speedy transfer of improved water and energy technological interventions to the stakeholders. In his thought provoking inaugural address, Dr H. S. Gupta, Director, IARI said that population growth; urbanization and growing consumption of water and energy continue to disrupt our fragile ecosystem. Elaborating further, he added that today around 2.8 billion people live in areas of high water scarcity and 2.5 billion have no or unreliable access to electricity. By 2035, both global energy and water consumption are expected to further increase by 50% and 85% respectively and therefore by proper appreciation of inter-linkages between water and energy, we can evolve climate resilient and robust green economies. Dr B. R. Sharma, Coordinator, International Water Management Institute, Sri Lanka –India programme, an internationally acclaimed Water Management Scientist in his keynote address has emphasized that large part of the food security achieved by India is water insecure and highly energy intensive as groundwater has emerged the main source of irrigation. He also mentioned some of the successful examples to alleviate food-energy nexus like Jyotirgram Yojana in Gujarat and its variations in other States, regulation of paddy transplanting in Punjab and Haryana, temporary power connections to farmers during rabi season , farm ponds in MP; changes in the Groundwater Regulation Act in West Bengal. He appreciated the efforts for raising awareness, devising technical innovations and contributing to policy dialogues to ensure water, energy and food security for all. Dr Ravinder Kaur, Project Director of the WTC, IARI while setting the stage for the World Water Day celebrations said instead of looking at energy and water as independent social challenges impacting environment, the stakeholders, including farmers need to be trained and educated for saving water and in turn energy. Highlighting the importance of public private partnerships for creating open innovation systems, she hoped that today’s joint celebration of World Water Day would lead to the implementable ideas and solutions to a myriad problems dogging the Indian agriculture, especially the judicious use of our limited precious resource - The Water.